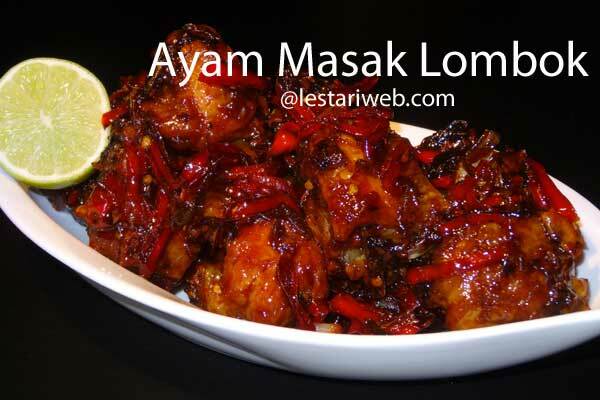 Beside Ayam Taliwang, Lombok Island also has delicious chicken dish called "Ayam Masak Lombok" or literally means "Chicken Cooked in Lombok Style". It can also means "Chicken Cooked in Chilies". The main characteristic of Lombok's cuisine is very spicy because they use lot of chilies either large red chili, eye bird chili or curly scharf chilli. Compare to Java or Sumatran dishes, Lombok culinary seasoning is considered to be a simple mixture, means it doesn't require long list of ingredients. But the taste Wow !! 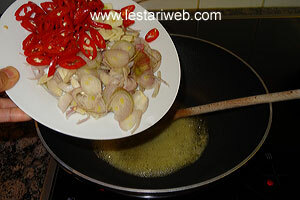 I will describe Lombok specialties just as "Simple Seasoning, Perfect Taste ;-). 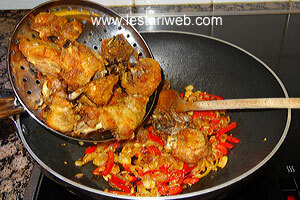 As a proof, you can see how "Ayam Taliwang" has gained it's popularity throughout Indonesian archipelago in now days. Anyway back to Ayam Masak Lombok, this is actually stir-fry based recipe & the secret of delicious asian stir-fried dishes is more spice is better then too little. 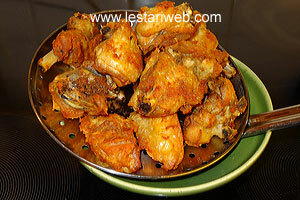 The spice should be well fried before the main ingredient (here is fried chicken) to be added-on. With this tipp, you'll obtain the best taste. ATTENTION : HOT & SPICY !!!! Only for Chili fans. 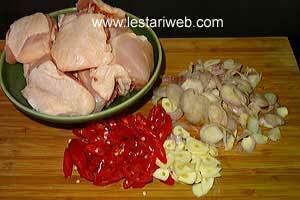 If preferred you can add eye bird chilies to satisfy your chili appetite but take on your own risk ha ha..
Cut the chicken breast in small portions, wash & set aside to drain. 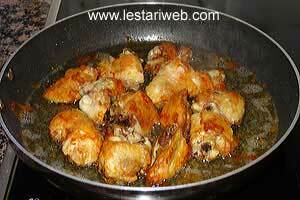 Heat 200 ml oil in a frying pan over a high heat, fry the chicken until crispy-golden brown. Set aside to drain. 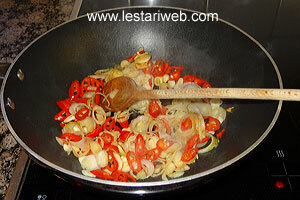 Heat 2 tbsp margarine in another frying pan & stir fry shallot & garlic over medium heat until transparent & fragant. Add the chillies. Stir all the time until wilted. (Add salt immediately if the chili's fumes causes you to cough uncontrollably ;-). 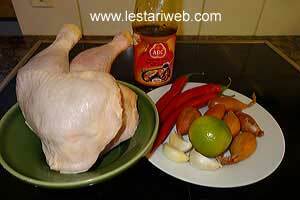 Add the fried chicken & adjust the stove into low heat. 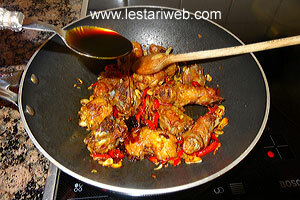 Add kecap manis evenly to the chicken, stir to mix. 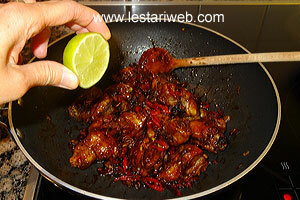 Add the lime juice, stir to mix. Adjust the seasoning, add salt if necessary.